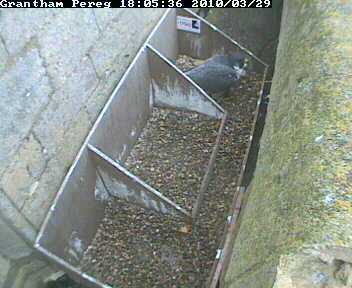 Grantham Peregrine Project: 29th March - first egg? At 19:00 hours today........is there an egg? She had been sat at the far end of the nesting tray for some time when she stood up to reveal what looked like an egg. She was calling to her mate who stood on the parapet wall just out of view. It's difficult to tell from the image below.....if it is an egg, she's chosen the end of the tray furthest away from the camera.